Talk about heavy hitters! 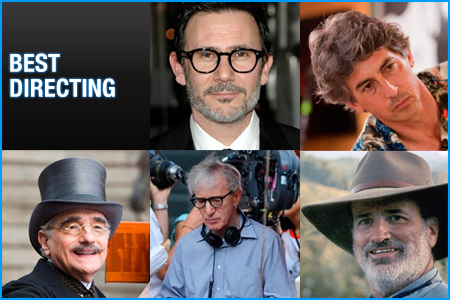 These are some of the most celebrated directors in film today, with the exception, of course, of relatively unknown Frenchman Michel Hazanavicius. Funny enough, I'm predicting the unknown to trump them all. The Artist could have easily gone into the territory of mockery, and while there was certainly a lot of over-the-top antics and comedy, it always felt genuine and heartfelt, a tribute to the old movie magic of 1920s Hollywood instead of a parody of it. All of that can be credited to Monsieur Hazanavicius, and I believe the Academy will be crediting him plenty come Sunday night. Of course, that is not to take away from the tremendous achievements by his competitors, and I'd be willing to bet that there are quite a few voters out there wanting to hand the award to Martin Scorsese for his beautiful Parisian homage to film preservation wrapped up in a children's 3D movie. I'll cut right to the chase. There's not going to be a split this year. The momentum is clear and the frontrunner is obvious: The Artist is your winner. It wasn't my personal favorite of the year—and, to be fair, Harry Potter and the Deathly Hallows: Part 2 wasn't even nominated—but it was pretty darn close to the top and it has all the makings of an Oscar champion. Let's be honest, how can we be upset that the Best Picture frontrunner is an independent silent, black-and-white French film?! This year's crop of nominees is a pretty good, if a little safe, group. I would have loved to see the likes of Harry Potter, Bridesmaids, Rise of the Planet of the Apes or Drive receive the elite distinction of Best Picture nominee, but it was not meant to be, I suppose. The only picture I haven't seen here is War Horse, so I cannot speak to that, but I do not understand all of the love for Midnight in Paris or, for that matter, all of the vitriol being spewed toward Extremely Loud & Incredibly Close, which I very much enjoyed. 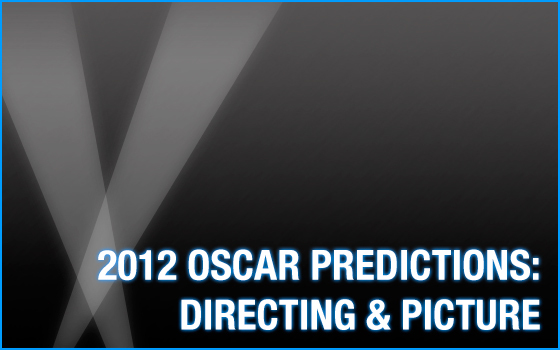 The Oscars being what they are, it's pretty much a given that you need nominations in both directing and editing in order to really be a contendor for Best Picture, so that means the only potential upsets on Sunday would be from Hugo or The Descendants. To me, however, the true dark horse is The Help. It doesn't have the necessary nominations by a long shot (three acting nominations and picture do not a champion make), but it was by far my favorite of this group. After its huge victories at the SAG Awards, could the actors—the largest branch in the Academy—band together and push The Help to victory? Not bloody likely, but it sure would make for an exciting night! I'll return tomorrow will my full list of predictions in all 24 categories, and if I have some time I may even make a dream list of winners just to keep things interesting. 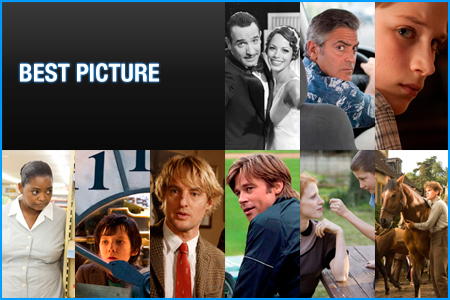 In the meantime, make sure you enter the 2012 Please Welcome Your Judges Oscar Contest for your chance to win an Oscar-winning film on DVD!